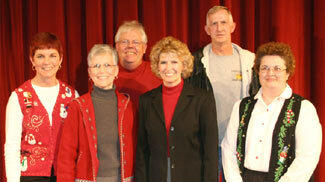 CAPTION: Chillicothe R-2 Superintendent Dale Wallace (back row, left), announced the recipient of the 2006 Teacher of the Year yesterday (Monday) at the Gary Dickinson Performing Arts Center. Each nominee for the reward received the following from the Chillicothe Educational Foundation: $500 cash and $1,000 for educational supplies, equipment or professional development. The recipient of the award received $1,500 cash and $1,000 for educational items, also from the Chillicothe Educational Foundation. 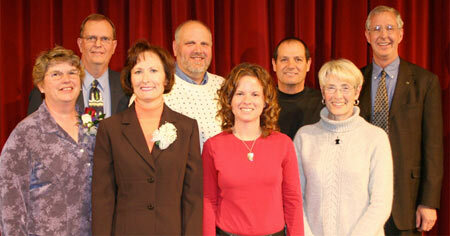 Pictured are the nominees for the award, from left: Charlotte Miller, Central School fifth grade teacher; Wallace, Mary Turner, Title Reading teacher at Field School; Keith Dietzschold, Grand River Technical School agriculture education instructor, recipient; Carrie Frakes, Dewey School first Grade teacher; Phil Willard, athletic director, head football coach and physical education instructor; Janet Barnart, communication arts, reading and journalism teacher at the Chillicothe Middle School; Ed Douglas, Chillicothe Educational Foundation president. 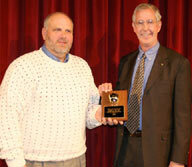 CAPTION: Grand River Technical School agriculture education instructor Keith Dietzschold accepted the 2006 Teacher of the Year Award from R-2 School Superintendent Dale Wallace yesterday (Monday), during an awards ceremony held at Gary Dickinson Performing Arts Center. Other teachers nominated for the award were, from left: Phil Willard, athletic director, high school head football coach and physical education instructor; Charlotte Miller, fifth grade Central School teacher; Mary Turner, Title Reading teacher at Field School; Carrie Frakes, first grade teacher at Dewey School; and Janet Barnhart, communication arts, reading and journalism teacher at the Chillicothe MIddle School. Several Chillicothe R-2 School employees and teachers were honored Monday during the 15th annual Teacher of the Year program held at Gary Dickinson Performing Arts Center. District Superintendent Dale Wallace served as master of ceremonies and aided by R-2 board president John Cook, the two honored several district employees for their years of service. However, the highlight of the event occurred at the end of the program with the announcement of the 2006 Teacher of the Year. That award went to Keith Dietzschold, Grand River Technical School agriculture education instructor. In accepting his award, Dietzschold expressed his gratitude to the Education Foundation, R-2 administrators, R-2 school board members, teachers, students and parents. "Without them, there�s no way you can accomplish all you do for education," he noted shortly after receiving the award. He added, "I also want to thank my fellow agriculture teachers for their support and willingness to work together for the good of our department." As the 2006 Teacher of the Year, Dietzschold receives $1,500 cash and $1,000 for educational expenses from Chillicothe Educational Foundation. Ed Douglas, foundation president, made a few remarks and distributed awards totaling a combined $10,000 to Dietzschold and the other teachers nominated for the award. "There are many things that affect quality education, but good teaching is where the rubber meets the road. It�s what really makes a difference," he said prior to the big announcement. Douglas explained that the foundation also works to encourage excellence in education through its Mini Grant program and the administration of several scholarships. He also noted that Chillicothe Educational Foundation has also been working on the future expansion of the school district by purchasing land north of the high school. In announcing Dietzschold as the 2006 Teacher of the Year, Wallace explained that the agriculture educational instructor was asked by his supervising teacher to live and learn by three simple rules. Be prepared, take care of discipline, and don�t forget your family. "People who know (Dietzschold) will say he does just that," Wallace said. He added that it was written that great teachers believe in education and believe in service. "The Teacher of the Year demonstrates this every day through his involvement with the students, the school, his church, the community and even state and national organizations," Wallace said. The superintendent also said that Dietzschold has been described in many different ways � a tireless worker, kind, professional, positive, creative, eager to help, dedicated, mentor and advisor. Among many awards, Dietzschold has previously received the Outstanding Teacher Award from the University of Missouri, Eddy Award from Missouri Public Education and Teacher of the Year from the Missouri Vocational Association. "Mr. Dietzschold has been teaching for 22 years with the last 10 being an agriculture education instructor at the GRTS. For Mr. D, the greatest reward of teaching walks through his door every day... and that is his students. "Learning to Do, Doing to Learn, Earning to Live, and Living to Serve," is the FFA motto. Mr. Dietzschold believes that we cannot teach teach our students if we do not believe or live what we teach. If there's a person who lives what they teach, then Mr. Dietzschold exemplifies what teaching is all about. Not only does he teach his students about agriculture, he teaches them about the importance of being able to provide for themselves and their families. His students are always prepared for the next step in their careers, both technically and academically, because of the strong foundation of skill, experience, and drive the Mr. Dietzschold instills in them. One student wrote of Mr. "D", He demands that students work hard and does not accept less than our best, and when we find our best, he teaches us how to use it." Dietzschold was one of six teachers nominated for the Teacher of the Year award. Others up for the honor were: Carrie Frakes, Dewey School first grade teacher; Mary Turner, Field School Title 1 reading teacher; Charlotte Miller, Central School fifth grade teacher; Janet Barnhart, middle school communication arts, reading and journalism teacher; and Phil Willard, athletic director, head football coach, and high school physical education instructor. The nominated teachers each received $500 cash and $1,000 for educational supplies, equipment or professional development, also from Chillicothe Educational Foundation. 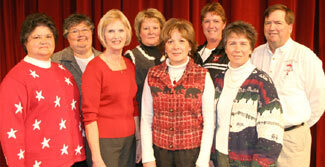 Cook also distributed plaques and pins to R-2 teachers for their years of service to the district. Those honored with plaques for 30 years of service were: Pam Brobst, Dewey School principal; Donna Buzard, high school Spanish; John Musser, high school science; James Radel, middle school social studies; Butch Rardon, R-2 bus mechanic; Kathy Rinehart, Central School secretary; Margaret Vance, Central School art; Roger Wolf, GRTS director. Receiving plaques for 25 years of service to the district were: Amy Baker, high school and Field physical education; Cindy Baker, high school counselor; Diana Boyd, high school secretary; Mary Dusenberry, Field School aide; Maurice Farrell, high school librarian; Jenny Marks, Field School aide; Emily O�Dell, Central School fourth grade; Carolyn Rader, high school cafeteria; Jody Rodenberg, Field School third grade. Those receiving pins for 20 years of service were Terri Figg, elementary speech pathology; Mike Lair, high school social studies. Teachers receiving pins for 15 years of service were: Mike Christopher, middle school custodian; Nancy Elliott, middle school alternative school; Cynthia Foster, high school social studies; Dianna Haynes, elementary behavioral management; Mary Turner, Field School Title 1; Debra Willard, Dewey School kindergarten. Those receiving pins for 10 years of service were: Patty Adkison, Dewey School kindergarten; Jayme Caughron, GRTS assistant director; Laurinda Davison, middle school librarian; Keith Dietzschold, GRTS agriculture education; Vicky Duckworth, GRTS electronics; Chad Dudley, GRTS diesel mechanics; Jill Gibson, Garrison PAT; Arch Haslar, GRTS collision tech; Gary Huckaby, GRTS custodian; Tracy Miller, Field School third grade; Polly Musselman, elementary computer supervisor; Connie Quigley, Dewey School cafeteria clerk/aide; Jane Schmitz, Garrison preschool; Debbie Shafer, high school aide; Annie Shipp, high school math; Chad Snyder, high school physical education; Nancy Thorne, high school science. Receiving five year pins for their years of service were: Tom Gatson, high school social studies; Rick McCully, high school custodian; Tony Perry, assistant high school principal; Patty Slattery, middle school aide; Dale Wallace, superintendent; Karen Young, Field School cafeteria clerk/library aide. Several other school board members were also on hand for the event including: Julie McCoy, Rick Baker, Neil Dietz and Randy Constant. All those attending were invited to a reception with refreshments following the program in the performing arts center lobby. Chillicothe R-2 employees honored yesterday (Monday) for 25 years of service to the district are, from left: Mary Dusenberry, Field School aide; Diana Boyd, high school secretary; Jenny Marks, Field School aide; Cindy Baker, high school counselor; Jody Rodenberg, third grade teacher; Amy Baker, high school and field physical education teacher; Emily O'Dell, fourth grade teacher; Maurice Ferrell, high school librarian. Not pictured is Carolyn Rader, high school cafeteria worker. Chillicothe R-2 employees honored yesterday (Monday) for 30 years of service to the district are, from left: Margaret Vance, Central art teacher; Kathy Rinehart, Central secretary; John Musser, high school science teacher; Pam Brobst, Dewey School principal; Butch Rardon, R-2 bus mechanic; Donna Buzard, high school Spanish teacher. Not pictured is Jim Radel, middle school social studies teacher; and Roger Wolf, Grand River Technical School co-director. Keith Dietzschold (left) was awarded the 2006 Teacher of the Year award yesterday (Monday) during an awards ceremony held at Gary Dickinson Performing Arts Center. Pictured with Dietzschold is Ed Douglas, president of Chillicothe Educational Foundation.